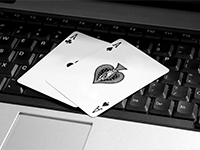 Home » Game News » Can Online Poker Be Your New Career? The current economic crisis means that many people are struggling to find work or are desperate to supplement their income with more money. In this light, it is easy to see why so many people are turning towards online poker as a way of making money. There is a growing number of players that are looking into playing poker full-time and it is easy to see why it is an attractive option for many players. The number of online poker sites, even in the United States, providing poker games and tournaments is huge, which means that there is always an opportunity to make money. The fact that online poker is a global phenomenon means that there are always games taking place and as long as you are legally entitled to gain access to the sites and games, you have a chance to play when you want. The reason that many people want to become a poker player is the fact that they can choose their own schedule. There is no doubt that there is a sense of freedom that comes from playing on US poker sites as a living but before people get carried away, it is important to understand a few ground rules. First of all, you should never really turn to gambling to solve your money problems. The clue comes in the name, it is a gamble, there is no guarantee of success and you may find that you exacerbate your financial difficulties by spending money that you didn’t really have to spend. Some people will tell you that you need to speculate to accumulate in life but with poker, this is a risky business. There is a need to have a bankroll to start with, which means that people really need to have an amount of savings behind them before they start to play poker for a living. Even then, you need to be realistic as to how you will make your money and provide for yourself or your family. While there are plenty of professional poker players around the world, you need to consider how many players would love to be professional poker players. This is the far greater number and there are many different reasons for this. In any game of poker, there are far more losers than there are winners, which means that making money can be difficult when playing poker. The fact that there are so many US friendly poker sites to choose from is a great thing. There is nothing wrong with playing poker for fun and it is something that most people should consider if they want to play poker. However, it is best to put aside thoughts of becoming a professional poker player until you discuss it with family and spend a lot of time playing for fun and counting how much money you win or lose. Times may be tough but becoming a professional poker player is rarely the answer.